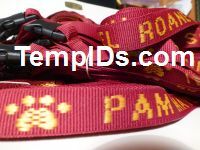 Included in the base price of personalized lanyards is the attachment choice of either a swivel hook or key ring. 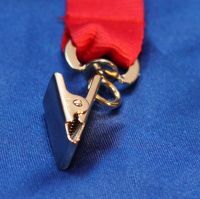 An attachment is the metal found at the end of the lanyard that you would hitch a badge or keys to. The swivel hook (pictured below on the left) is the most popular attachment followed by the key ring (pictured below on the right). The swivel hook is the traditional attachment. The reason for its popularity is that it conveniently, efficiently, and quickly connects to badges, access cards, and keys. 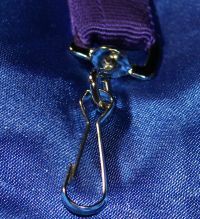 Some refer to the swivel hook as a J hook. The key ring attachment is the second most popular fitting. Some of its popularity stems from its familiarity. Everyone has at least one key ring. It does take a few extra seconds to feed this key ring to attach it to keys, badges, and other key rings. People feel that once they go through the task of opening up the key ring, the object is locked in for good. 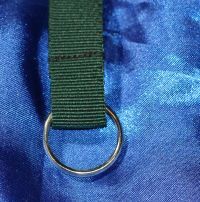 The key ring is also referred to as a split ring. Premium Attachments. 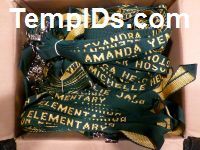 These metal fittings for personalized lanyards are extra. Prices shown as per unit. 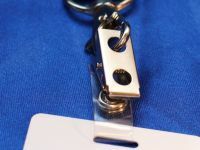 The bulldog clip is the least popular attachment found on personalized lanyards. It is severly limited by its design. The bulldog clip can only attach to an ID card that has an oblong hole. Many people use a round hole on their card. 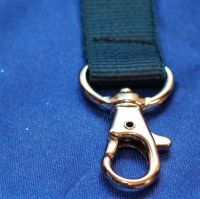 You can't attach keys to this attachment as shown, which in some cases, is the only reason why lanyards are being used. 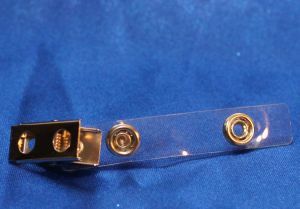 You can only attach keys if you purchase the strap clip (see below), but you are looking at paying a premium price for the bulldog clip and paying extra for the clip. The lobster claw is the most popular premium attachment. It has a richer look than the other designs. Since it is more expensive than the standard metal fittings. Some may be familiar with the claw found on jewelry. This grade of attachment is a heavier grade than those found on necklaces and bracelets. The lobster claw is similar to the swivel hook in how easy it is to affix ID cards and keys. The strap clip is not an attachment offereed as an exclusive fitting like the other attachments outlined above. It is an accessory to use with one of those attachments. The strap clip is similar in design to the bulldog clip, but with two important differences: it comes with a 2 3/4" strap that you feed through the oblong hold found on slotted ID cards and badge holders. The other distinction: two holes stamped out on one side of the clip. One can easily attach a swivel hook or claw to one of the holes for the badge and have room to spare to secure keys. Some customers find that the strap is easier on the ID card instead of the metal on the plastic card. You can order the clips in increments of one.